America's sports car racing series that isn't ALMS visited the Homestead Speedway in Miami over the weekend, only to get rained out with an hour left in the race. Our friends at MotorSportMedia bring us the hot, wet action in still shots and video. Top team SunTrust Racing started from the back of the Daytona Prototype cars, but took their Corvette DP up to third and on to the overall win – the second consecutive win for Corvette prototypes. The gorgeous AIMAutoSport Ferrari got their first win in Grand Am on only their third race in the series. The #69 458 Italia edged out Team Sahlen's RX-8 and Stevenson Motorsports' Camaro for the top place on the GT podium. 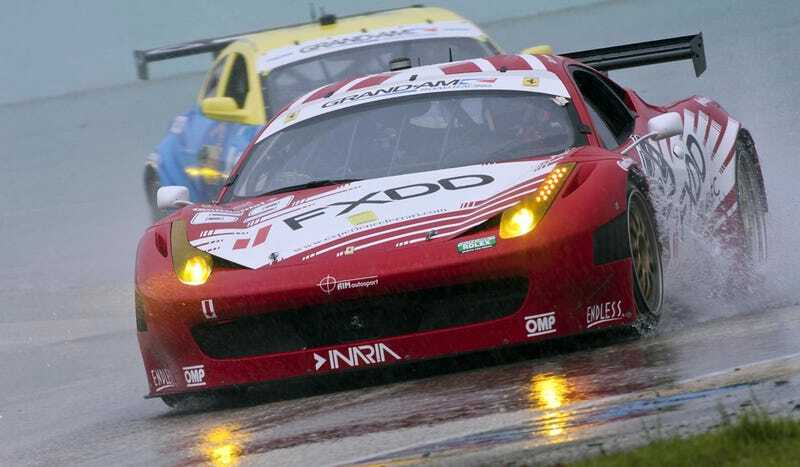 The main feature of the race wasn't the cars themselves, but the rain. It came in the form of multiple downpours, leaving standing water everywhere. The track wasn't draining and the cars kept spinning, so the officials called the race at 3PM, 52 minutes before the planned finish. Click through the gallery to see the pictures from the race, as well as onboard video from Seth Thomas's #82 BMW 328i practicing for the smaller-classed Continental Tire race.